On Friday, February 18 at 5:30 pm, we arrived to our second camp at 3500m and our crew welcomed us to camp with dinner and also with warm water to wash up. 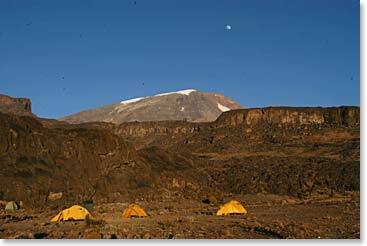 On Saturday, February 19, we left our camp at about 8:30am and arrived at Moir Camp at about 4:00pm. We hiked across the plateau and then started climbing to about 4100m. 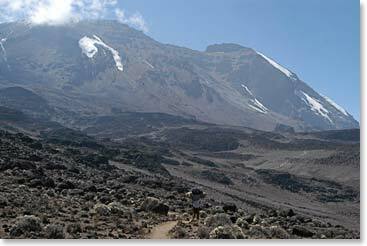 We were surrounded by such beauty and could see the top of Kilimanjoro, our goal. We were welcomed warmly by our crew, Eric and Elkana. The meals have been excellent. Sunday, we left our camp at 9:15 am. Hiking at elevation has its challenges, but we are taking it one step at a time. 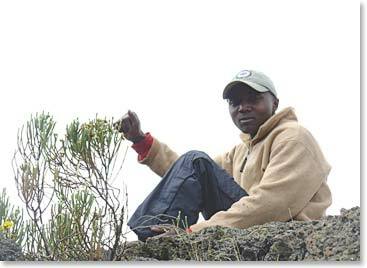 Our guides are excellent about helping us through the journey with the steady increase in elevation. We arrived at Lava Tower at 1:15pm and were greeted with crew and lunch. We are now at camp at 4600m, it is time to rest after a fantastic lunch. Love to all our family and friends. Over and out. Note: The phone connection today was inconsistent and some part of the introduction was lost, we apologize for any omissions. Stay tuned as Joanne and Dave continue to climb.